Congratulations and thank you for choosing AX Social Stream! AX Social Stream WordPress Plugin is the best choice for those who are looking for an easy way to share their social networking updates on their website. This plugin gives you a combined social media stream for all of your social network updates, and can display them in 6 different formats: Wall, Timeline, Rotating Feed, Sticky Rotating Feed, Ajax Tabbed Feed & Sticky Ajax Tabbed Feed. It supports 17 and growing social networks and includes about 30 feed options. 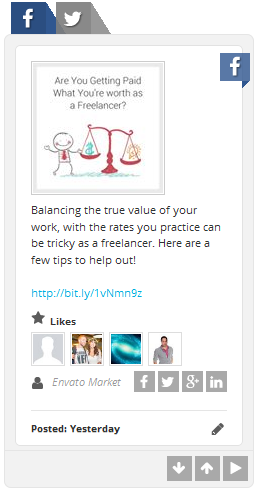 Your visitors will be able to share your posts on Facebook, Twitter, Google or Linkedin from your website. They will also have the option to reply, retweet or favorite the Twitter posts on your Social Stream. They can even filter your Social Stream by social network. You can also change the style of your Social Stream using the theme manager and/or custom CSS stylesheets, and make it unique to your website. If you have any questions or suggestions concerning to AX Social Stream WordPress plugin, please contact us via our page on CodeCanyon or via our website. Note: We provide free installation and configuration for clients. After purchase, simply contact our support desk and provide us your website information to get this service for free. This is by far the easiest way of installing a WordPress plugin. 1. Go to your WordPress admin panel. Click on Plugin » Add New. 2. Then click on the Upload Plugin button. You will see a screen like the one above. 3. Click on the Browse button and select the plugin file (zip files only) from your hard drive and upload it. 4. Click on Activate Plugin link to complete the plugin installation. You can also activate the plugin by clicking on Activate link in the plugins page. 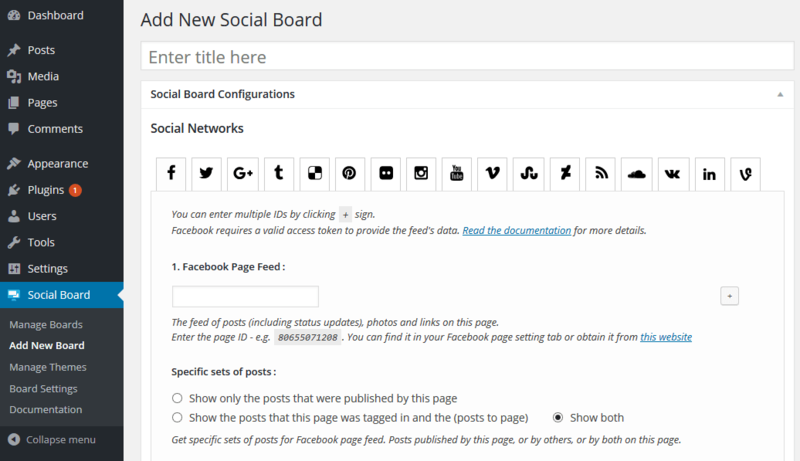 Now you have installed the AX Social Stream WordPress plugin. You would have to read the quick start guide, create your Social Stream, add your Social Stream on your website and configure the settings to fit your needs. The plugin also works with WordPress Multisite. After installation, you will be taken to the “activate a plugin” page. Click on Network Activate link to complete the plugin installation. Go to WP Admin » Plugins, Deactivate and Delete your last "AX Social Stream" plugin installation. Install the new plugin using the "ax-social-stream-x.x.zip" new file. After installation, go to the Social Stream » Stream Settings page and just click the "Save Changes" button once. To receive the product automatic updates you need to register your plugin. Click here to find out more. After registering the plugin, browse to the Plugins » Installed Plugins page. Find the AX Social Stream and click check for updates under our plugin. You will get a message saying: "A new version of this plugin is available." Scroll down to the plugin again and click update now under it. Note: You will not lose any data or configurations during the upgrading process. The plugin requires the PHP version 5.6.x or higher. The plugin requires the WordPress version 3.8 or higher. This script requires both PHP's multibyte string extension AND iconv extension. PHP's XML extension is required (enabled by default). After installation, you would have to create your Social Stream. Here we will explain you that how to create different form of feeds on your website. In this topic we create a Facebook wall on our website. Go to Social Stream » Add New Stream and fill out the form as follows. For more information about creating/editing a Social Stream click here. Go to Social Stream » Manage Streams. Copy the Wall Shortcode that is marked with a red circle. Paste the shortcode into your created page content as follows. You can also put the shortcode in a post instead. Your social wall is ready now. Go to your created page by clicking on the “View Page” button. 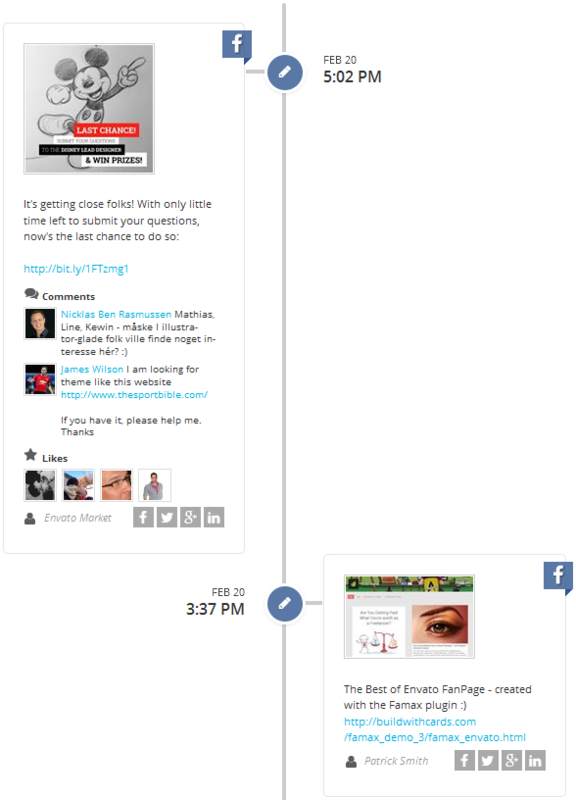 In this topic we create a Facebook timeline on our website. Follow the same steps 1 - 3 that you did for the Wall. Copy the Timeline Shortcode that is marked with a red circle instead. Your social Timeline is ready now. Go to your created page by clicking on the “View Page” button. In this topic we create a Facebook carousel on our website. Copy the Carousel Shortcode that is marked with a red circle instead. Paste the shortcode into your created page content. Your social Carousel is ready now. Go to your created page on your website to see the result. In this topic we create a Facebook + Twitter rotating feed on our website. In this step, you need to set the Twitter API Credentials in the Social Stream » Stream Settings page. Read this topic for more details. Paste the shortcode into your created post content and set the width/height of the feed as follows. You can also put the shortcode in a page instead. Your social Rotating Feed is ready now. Go to your created page by clicking on the “View Page” button. Note: You first need to enable the Rotating Feed from Enabled Layouts section within the Stream Settings page to see the social stream widget in Appearance » Widgets page. In this topic we create a Facebook + Twitter sticky rotating feed on our website. Follow the same steps 1 - 3 that you did for the Normal Rotating Feed in the last topic and create a Social Stream. Go to Appearance » Widgets in the WordPress admin. 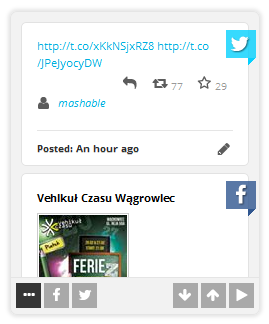 Find the widget with the title “Social Stream” and simply drag & drop it into your desired widget enabled area. Fill out the widget form as follows and save. Your social sticky Rotating Feed is ready now. Visit your website. In this topic we create a Facebook + Twitter Ajax Tabbed feed on our website. Follow the same steps 1 - 3 that you did for the Sticky Rotating Feed in last topic. 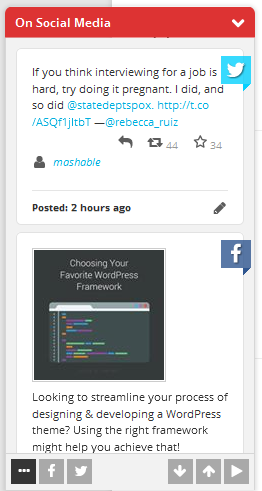 Your social Ajax Tabbed Feed is ready now. Visit your website. This section lists all of your previously added Social Streams. To edit a Social Stream, move your mouse pointer on the name of the Social Stream and click on the "Edit" link to display the Social Stream configurations in a new page. Make your desired changes and click the "Update" button to save the new configurations. To delete a Social Stream, move your mouse pointer on the name of the Social Stream and click on the "Trash" link. This will move the Social Stream to the Trash folder but, if you are going to remove it permanently from the WordPress system, just go to the Trash tab and delete it permanently. Here we will explain various parts of Add/Edit Social Stream form and all the relevant social network tabs. Enter a name that describes your Social Stream. This name is for your reference only. This section allow you to set up the networks that you want to include in your Social Stream. 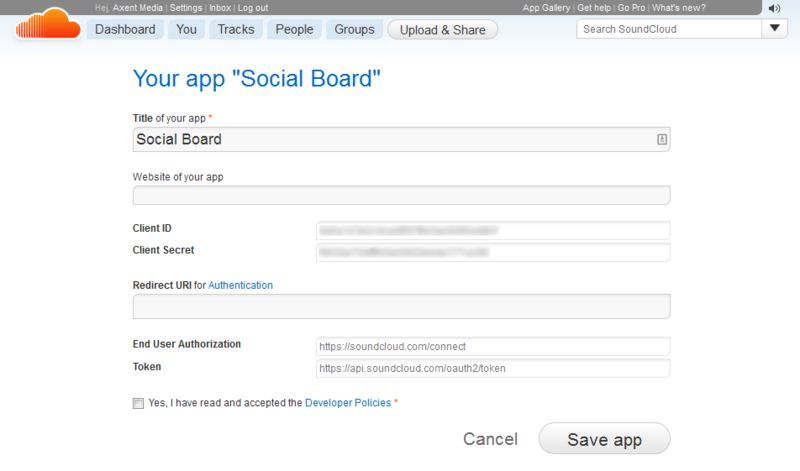 To add a social network to your Social Stream, go to its tab and fill out its configuration form. Select the content blocks that you want to be included in each item on the Social Stream. Each social network may have different type of content blocks available. Some social networks have multiple type of data available for each feed. Select the type of data you would like to be included in your Social Stream output. You can define custom filtering buttons to filter your wall items using different search terms. Here, you can find a working example of custom filtering wall. To add a specific social network feed to your Social Stream, you need to declare it using an option (ID, username, search term, etc) depending on type of the network. Some social networks have multiple type of feeds available. You are required to use at least one of the options available for the social network feed to make it available in your Social Stream output. Facebook requires authentication to provide the feed's data. Click here for more details. The feed of posts (including status updates), photos and links on this page. You can set here to get sets of posts published by this page, or by others, or by both on this page. You can find it in your Facebook page setting. Obtain it from this website (Page or Group ID both). Or, from this website (Page ID only). 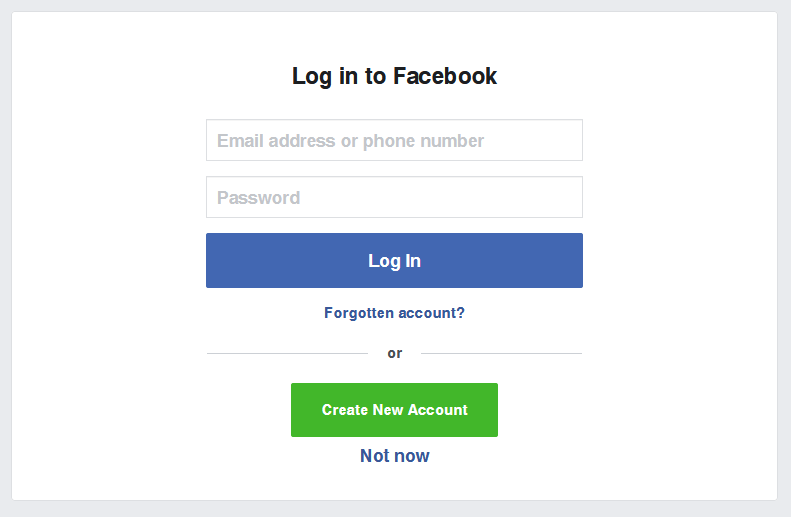 Replace “username” with the name of your Facebook page profile. It should churn out a result including your page ID. Shows all photos this page is tagged in. Enter the album ID or the page ID. Shows all videos this page is tagged in. Enter the page ID. Get posts in a certain date/time from Facebook feed. Twitter requires authentication to provide the feed's data. Click here for more details. Enter a Twitter username without “@”. Get posts in a certain ID range from Twitter feed. Since ID: Returns results with an ID greater than (that is, more recent than) the specified ID. Max ID: Returns results with an ID less than (that is, older than) or equal to the specified ID. How to find a specific tweet ID? Go to the Twitter home page at https://www.twitter.com/. If you are already logged in, you will be redirected to your Twitter page. Otherwise, login to your twitter account, which will also take you to your Twitter page. In the list of all tweets, find the specific tweet for which you wish to grab the ID. There is a date/time stamp underneath each tweet as pictured above. Click that date/time stamp. 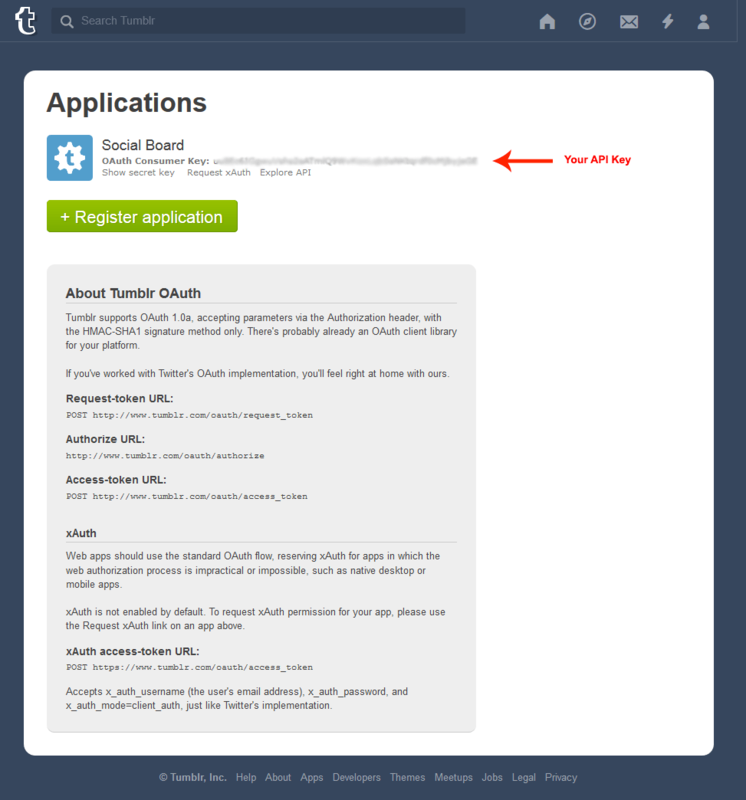 Tumblr requires an API Key to display feed data. Click here for more details. 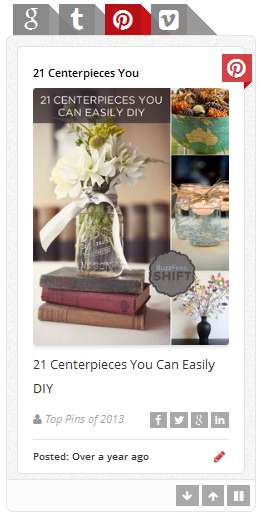 To show a Pinterest board enter the username, then "/" followed by the board name. 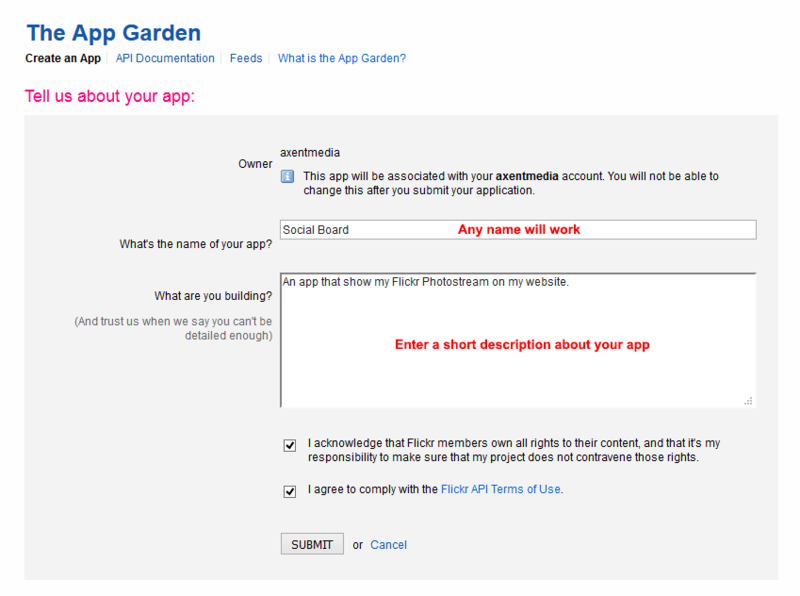 Flickr requires an API Key to display feed data. Click here for more details. Instagram requires your API Access Token to provide the feed's data. Click here for more details. To show the latest posts by a location, enter the location ID. How to find latitude and longitude coordinates of a location? Enter your location in the "Address" field. Click on "Get GPS Coordinates" button. You will get the Latitude and Longitude of the entered location on the map. Youtube requires an API Key to display feed data. If you have previously generated and added an API Key for Google you will no need to do it again for YouTube as they are both using the same key. Click here for more details. Select Snippet for displaying a summary of the post or select Full Text to include any links or images in the feed - if available. SoundCloud requires an API Client ID to provide the feed's data. Click here for more details. Returns a list of posts on a user wall or community wall. Enter the user or community short address - e.g. wphelpme or, ID of the user or community that owns the wall - e.g. id999999999. Enter the ID of the user or community that owns the wall. By default, current user ID - e.g. 99999999. Use a negative value - to designate a community ID - e.g. -99999999. LinkedIn requires an API Key to display feed data. Click here for more details. Returns a list of the company updates. Enter the LinkedIn Company Page ID - e.g. 10354180. Returns a list of user timeline updates. Enter the Vine username or ID - e.g. 974522892907909120. Note: Save the Social Stream configurations by clicking the "Update" or "Publish" button when it was done. Click on the name of the Social Stream you are going to do some manipulation. Scroll to the Manipulation section at the right panel of the form. Click the update button on the top of the right panel. How to find the Social Stream items' links? 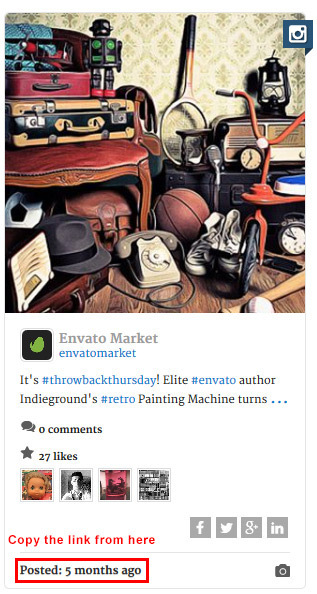 Each item on the Social Stream has a date/time in its footer area that is linked to the original post. You can copy that link to use here. Download and install Poedit translations editor. Poedit is an open source program for Windows, Mac OS X and UNIX/Linux which provides an easy-to-use GUI for editing PO and generating MO files. Open the social-board.pot that is located in the Assets folder in your downloaded CodeCanyon zip package file, in Poedit. Click on the "Create new translation" button. Select your desired local language that you want to create a translation for. Do, your required changes on translation items. From the File menu, select "Save as". 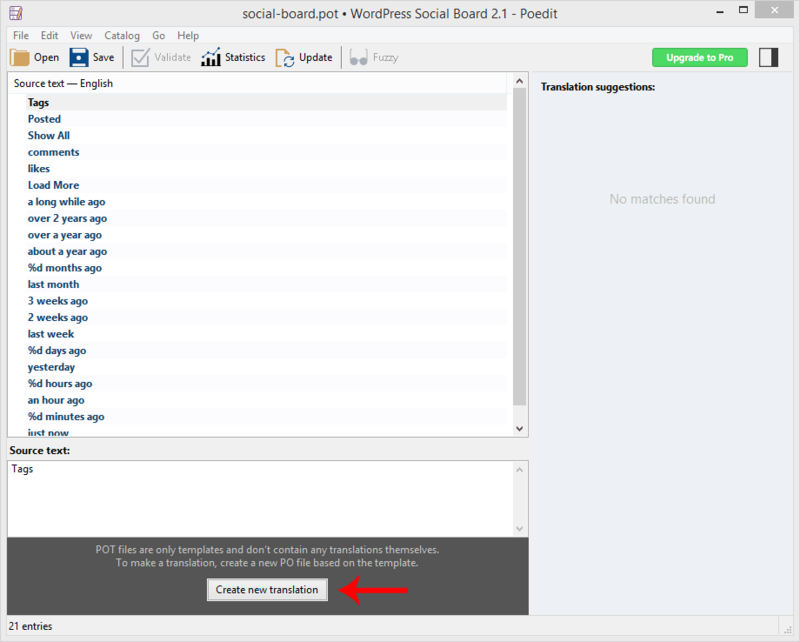 In the "Save as" window, select a name for your translation with this rule "social-board-<WP Locale>.po" - eg. social-board-nl_NL.po, and save the file somwhere into your computer. From the File menu, select "Complile to MO...". Upload the generated .po and .mo files from your computer into <your-wordpress-site.com>/wp-content/plugins/ax-social-stream/language/ (Social Stream language folder in your WordPress plugin directory) on your website using an FTP client. Find more info at Translate WordPress. All changes in this section will only effect the Social Stream default displaying settings. You can use inline parameters in shortcodes to override these default options for an individual Social Stream. These options apply to all display modes. Select a theme to style your Social Stream. Limiting the maximum number of results to display on the Social Stream. Limiting the description words count to display for each item on the Social Stream - Leave empty for no limit. Limiting the comment words count to display for each item - Leave empty for no limit. Limit of the title words count to display for each item on the Social Stream - Leave empty for no limit. This will define, how to display the user info for each item on the Social Stream. This will define, how to display the Social Stream item information in lightbox window. This will define, how to display the image for each item on the Social Stream. If checked, the (…) character at the bottom of each feed item will be linked to the rest of the content. Select whether to order the results depending on date of each item or randomly. If checked, a navigation bar of all active network icons will appear at the bottom of the rotating feed or above the social network wall. These icons will allow the user to filter the Social Stream items. If checked, a load more bar will appear at the bottom of the social network wall and loads more social items if clicked. If checked, all links will open in a new window else they will be open in the parent window. The time delay for caching of Social Streams (in minutes) - reduces up download time. 0 Zero value means no caching. NOTE: Make sure the `cache` folder inside the plugin folder is writable by the server (depending on your web hosting server, permissions set to 755, 775, or 777). If checked, all plugin errors will be logged in a file named "sb.log" in plugin folder. You can find all the problems that may occurs during the feed crawling process. NOTE: Make sure the `sb.log` file inside the plugin folder is existed and writable by the server (depending on your web hosting server, permissions set to 644, 655, or 666). These options only apply to the rotating feed display mode. Defines the animation speed (in ms) of the rows moving up or down. Defines the times (in ms) before the rows automatically move. Sets the direction of rotating feed movement to either "up" or "down". If checked, a feed control bar will appear at the bottom of the rotating feed allowing user to stop/start the rotating feed or go to next/previous item. Width of feed block (px) - Leave empty for no width. These options only apply to the wall display mode. This will enable/disable moving items with animation. The time delay for showing items. It will increase by each block item. If checked, a search box will appear above the social network wall allowing the user to filter the Social Stream items using a search phrase. Let layout to start render from left to right or, right to left. If you press this button, a confirmation message will appear and then if you press it again, it resets all the options to the default settings. Some networks require authentication to provide feed data. In this quick guide we are going to show you how to create an App in Facebook and get the App Token. This is required for all Facebook feeds. From WordPress admin panel, go to Social Stream » Stream Settings. On the Stream Settings page, switch to API Credentials tab and scroll to the Facebook API Credentials section. Click on Get my Access Token button. You will need to login to your Facebook account and authorize our Facebook App. You will be redirected back to this page again with Access Token field filled with your token. Scroll down to the page footer and click Save Changes. Click on Generate Access Token button. Then, you will be redirected back to the https://axentmedia.com/facebook-access-token/ page displaying the list of your Facebook pages with Access Tokens. 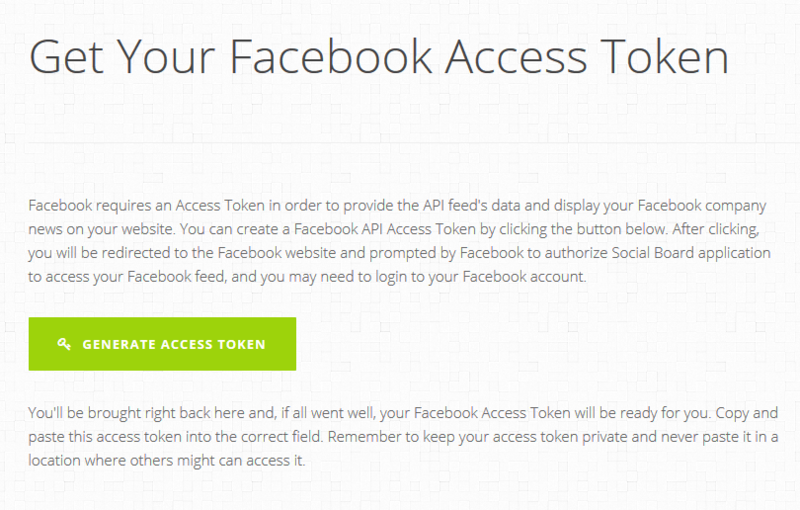 Copy one of your Access Tokens and paste into the Access Token field in Facebook API Credentials section in Stream Settings > API Credentials tab. Attention: If you want to use this method, your app must be reviewed and approved by Facebook for the 'Page Public Content Access' permission. Required For All Twitter Feeds. On the Stream Settings page, switch to API Credentials tab and scroll to the Twitter API Credentials section. You will need to login to your Twitter account and authorize our Twitter App. Attention: If you want to use this method, your app must be reviewed and approved by Twitter. Browse to: https://apps.twitter.com/ and sign in with your Twitter Account. You will be redirected to your Twitter Application Management area. Then click on "Create New App" button. Fill out the Name, Description & Website fields. 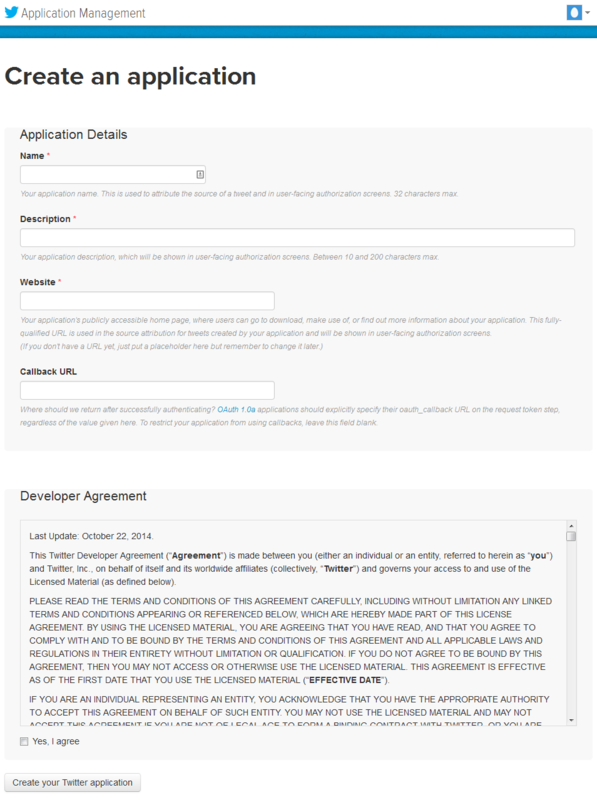 Read the "Developer Agreement" and check the "Yes I agree" box. Click "Create Your Twitter Application" button. 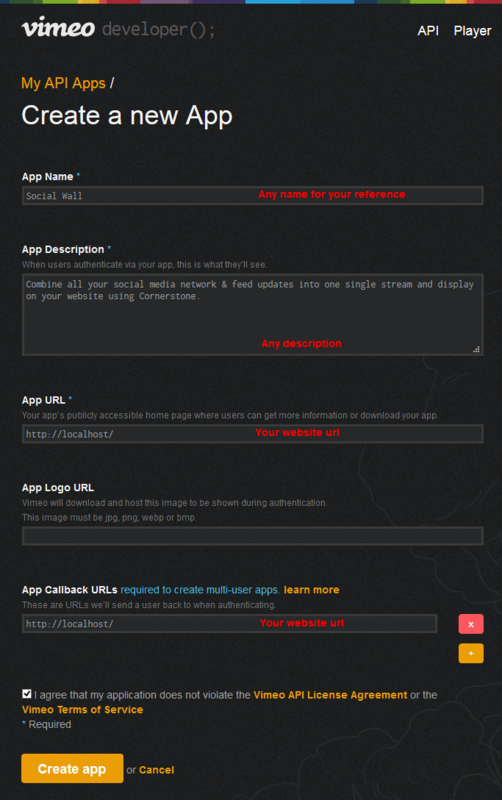 After creating the Application, the Application Details page opens. Go to "Keys and Access Tokens" tab. Click on the "Generate Consumer Key and Secret" button. Click on the "Generate My Access Token and Token Secret" button. Copy the API Key, API Secret, Access Token and Access Token Secret values and paste into the "Twitter API Credentials" form in "Social Stream Settings" page and the plugin should now have access to your Twitter feed data. Browse to your: Google Developers Console and sign-in with your Google account. A default project called "API Project" is created for you when you first login to the Developers Console. You can use that project, or create a new one by clicking the "Create Project" button at the top of the window. Select one of the projects in the list - e.g. "API Project"
If you select the previously created "API Project" for the first time, a popup opens asking you to set a Project ID. Click OK and continue. Click the bars button and select APIs & Services from the left sidebar. Under Google APIs, search and click on "YouTube Data API v3". Click the "Enable API" button on top of the "YouTube Data API v3" page to turn it on. Click back and you will have "YouTube Data API v3" under API Library tab. Click Credentials on the left sidebar, under Public API access, click "Create new key" button. 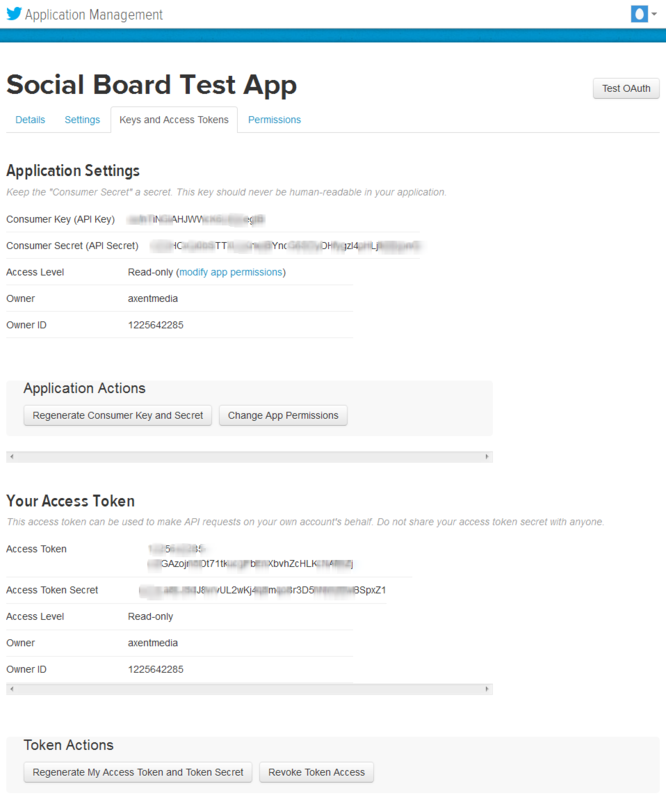 Copy your API KEY and paste into your Social Stream configuration form. On the Stream Settings page, switch to API Credentials tab and scroll to the Instagram API Credentials section. Click on Login and get my Access Token button. Authorize our Instagram App and you will be redirected back to this page again with Access Token field filled with your token. 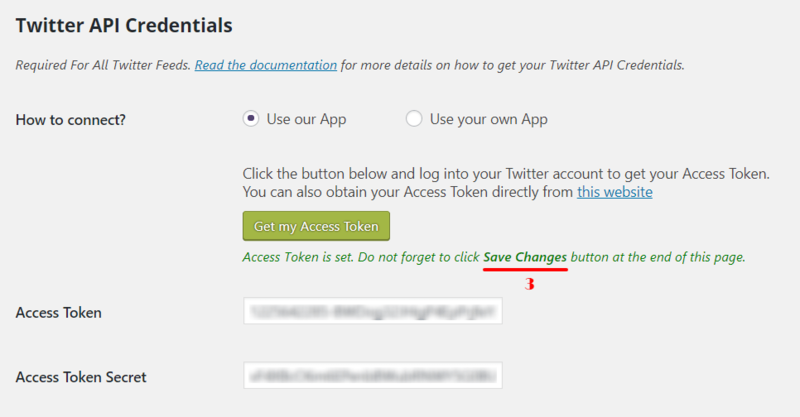 Click on green "Generate Access Token" button. You will need to login to your Instagram account. 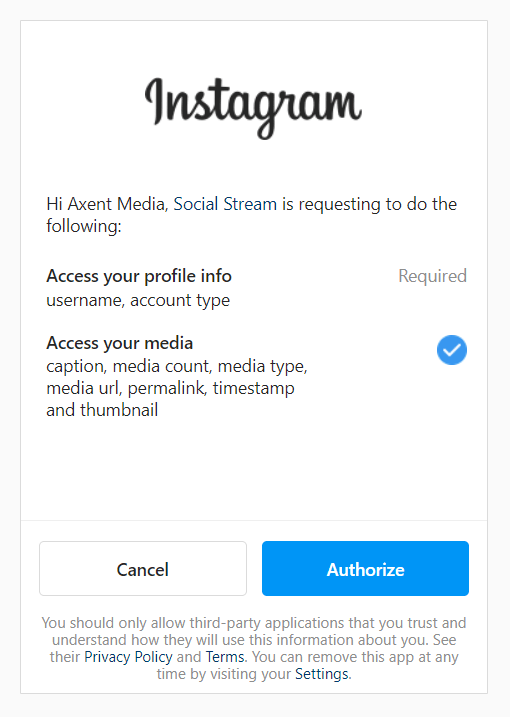 Then, you will be redirected back to the https://axentmedia.com/instagram-access-token/ page displaying your Access Token. Copy your Access Token and paste into the Access Token field in Instagram section in Stream Settings - API Credentials tab or use it in 1. Instagram User Feed section within Social Stream Configurations page to get feed result from more than one Instagram account. If you want to use this method with any other endpoint rather than "Instagram User Feed" (users/self/media/recent), it requires your app to be approved by Instagram. Browse to https://www.instagram.com/developer/ and login to your account if required. Click on Manage Clients, and finally click on Register a New Client. Fill out the required fields for registering a new Client ID. Set the OAuth redirect_uri field to "http://localhost" (without quotes). The reason you should use localhost is for security. In computer networking localhost is the web address of the computer you are using. So when Instagram redirects to your redirect_uri, all of your sensitive information is passed from Instagram's servers directly to your computer. Go to Security tab and uncheck the "Disable implicit OAuth" box or else this method will not work. Once all of the fields are filled out click Register. Replace Client ID with your Client ID you grabbed from your Instagram Manage Clients page and click on Login and get my Access Token button. 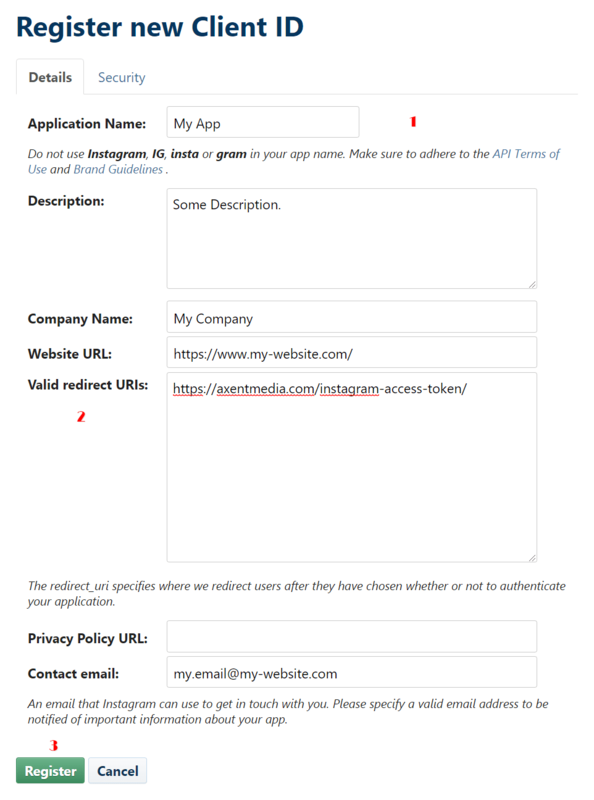 Authorize our Instagram App and you will be redirected back to API Credentials page again with Access Token field filled with your token. 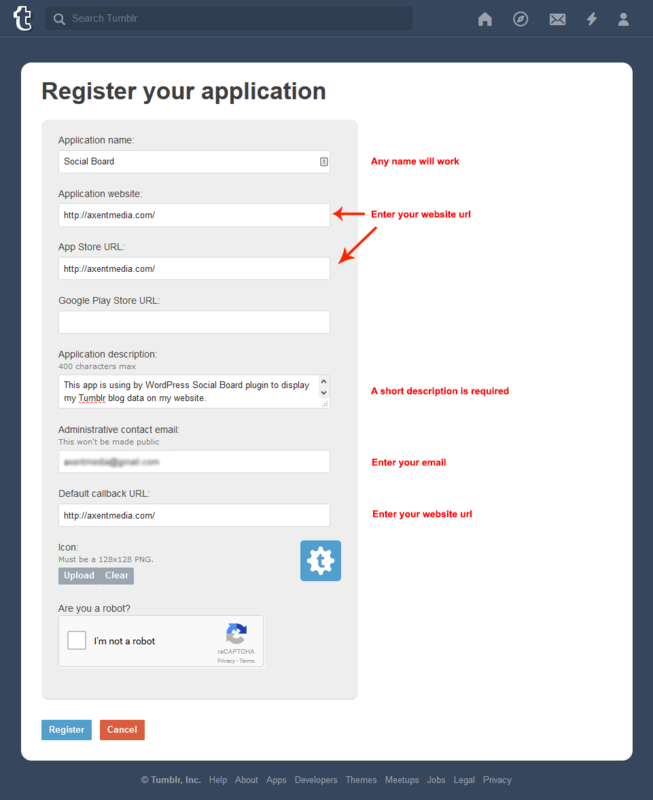 Browse to this page: https://www.tumblr.com/oauth/register. You will be redirected to "Login" page if you are not login to your account. Fill out the form as highlighted below and click on Register button to complete. In the next page, you will be provided with an Oauth Consumer Key and Secret Key. Copy the "Oauth Consumer Key" string and paste into "Tumblr API Key" text box in the Tumblr section of API Credentials tab in Stream Settings page. Browse to this page: https://www.flickr.com/services/apps/create/noncommercial/. You will be redirected to "Login" page if you are not login to your account. Fill out the form as highlighted below and click on SUBMIT button to complete. In the next page, you will be provided with an API Key and Secret Key. Copy the "Key" string and paste into "Flickr API Key" text box in the Flickr section of API Credentials tab in Stream Settings page. Browse to this page: http://soundcloud.com/you/apps/new. You will be redirected to "Sign in" page if you are not login to your account. Enter a name for your app - e.g. "Social Stream" and click Register. In the next page, copy the "Client ID" string and paste into "SoundCloud Client ID" text box in the SoundCloud section of Stream Settings page. 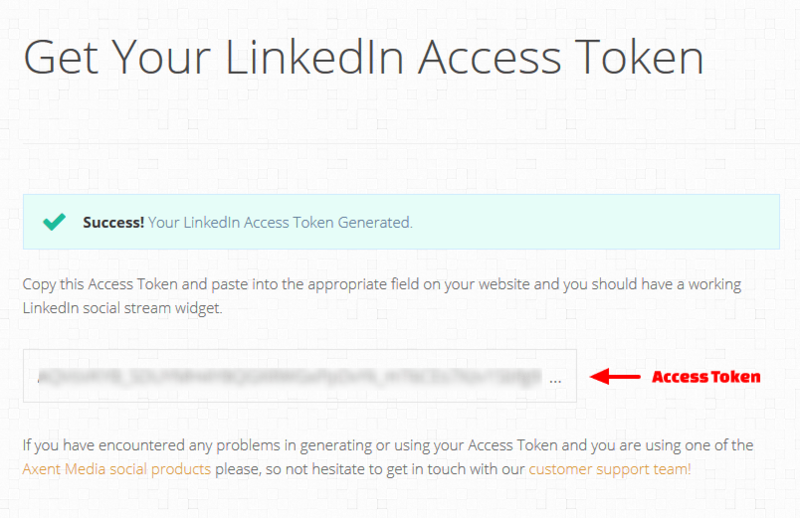 In this quick guide we are going to show you how to create and obtain your LinkedIn Access Token. This is required to get any type of LinkedIn feeds. 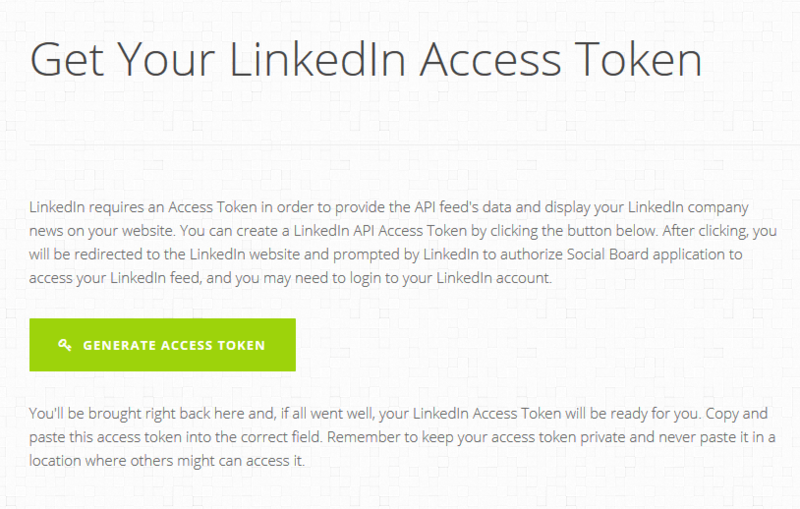 On the Stream Settings page, switch to API Credentials tab and scroll to the LinkedIn API Credentials section. You will need to login to your LinkedIn account and authorize our LinkedIn App. You will need to login to your LinkedIn account. Then, you will be redirected back to the https://axentmedia.com/linkedin-access-token/ page displaying your Access Token. Copy your Access Token and paste into the Access Token field in LinkedIn section in Stream Settings - API Credentials tab. Browse to this page: https://developer.vimeo.com/apps/new. You will be redirected to "Sign in" page if you are not login to your account. Fill out the form as highlighted below and click on "Create app" button to complete. 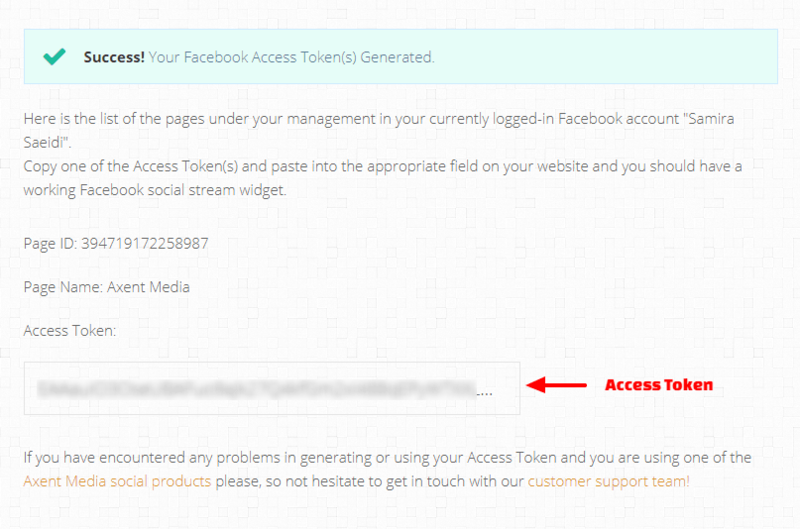 In the next page, scroll to the "Generate a new Acceess Token" section at the end of the page. Make sure to uncheck the "Private" from the Scopes. Click on the "Generate Token" button and copy the "Your new Access token" string and paste into "Vimeo Access Token" text box in API Credentials section. Browse to this page: https://vk.com/editapp?act=create. You will be redirected to "Sign in" page if you are not login to your account. Enter a name for the App in the Title input as highlighted below and click on "Connect Application" button to complete. 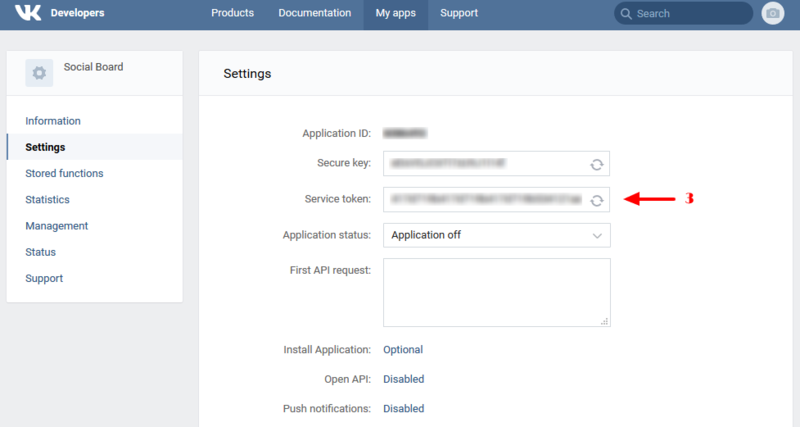 On the next page, in App Settings tab, copy the "Service token" string and paste into "VK Service Token" text box in API Credentials section. Add or edit the post or page that you want your Social Stream display on. Then, copy and paste the shortcode below into your post or page content. To add this Social Stream to one of your theme PHP files, use the PHP snippet below. Replace <Stream ID> with the ID of your Social Stream. You can also find the Shortcodes for your Social Streams in Social Streams management area. Go to: Appearance → Widgets in the WordPress navigation. Find the widget with the title "Social Stream" and simply drag it to your widget enabled area. Select a title for your widget. This will be set as your feed block title if "Display Header" is checked. 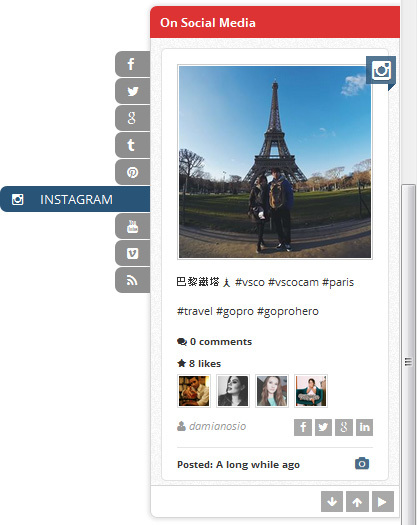 Select the Social Stream that you are going to add on your website, from the dropdown menu. Width of widget (px) - Leave empty for no width. Height of widget (px) - Leave empty for no height. You can override the stream default settings for this widget here by passing the parameters separated by & - e.g. order=random&cache=0 - Leave empty to use stream default settings. Drag the "Social Stream" widget into one of your widget enabled areas. Select one of the Social Streams from the dropdown box. From "Display Position" select "Normal Widget", the form will change. From "Display Position" select "Sticky Widget", the form will change. Make sure the "Ajax Tabbed" option is not checked. Select the location where you want to display your widget on the website from the Location dropdown box. Check "Ajax Tabbed" to enable Ajax Tabbed option. Set the height of your widget in the Height field. Set the other options according to your need and click Save. Your Social Stream by default, will use the settings that is set in "Stream Settings" page. These parameters can be used for all type of display modes. theme Social Stream layout theme sb-modern-light, sb-metro-dark, sb-modern2-light, sb-default-light, sb-flat-light, sb-modern-dark theme="sb-modern-light"
results Maximum number of results to display on the Social Stream. results="50"
words Limiting the description words count for items. words="40"
slicepoint Limiting the description words count for slides. slicepoint="300"
commentwords Limiting the comment words count for items. commentwords="20"
titles Limit of the title words count to display for each item. titles="15"
userinfo This will define, how to display the user info for each item. top, bottom userinfo="top"
readmore Link long blocks of text. 1, 0 readmore="0"
order Ordering date, random order="random"
filters Filter networks navigation bar will appear at the top of the Social Stream. 1, 0 filters="0"
loadmore Load more bar will appear at the bottom of the Social Stream. 1, 0 loadmore="1"
lightboxtype Lightbox content media, slideshow lightboxtype="media"
layout_image How to display the image for each item on the Social Stream. 1, 0 layout_image="imgexpand"
links Open links in a new window. 1, 0 links="1"
nofollow All links will have the status of nofollow. 1, 0 nofollow="1"
https All links and images will be getting over https. 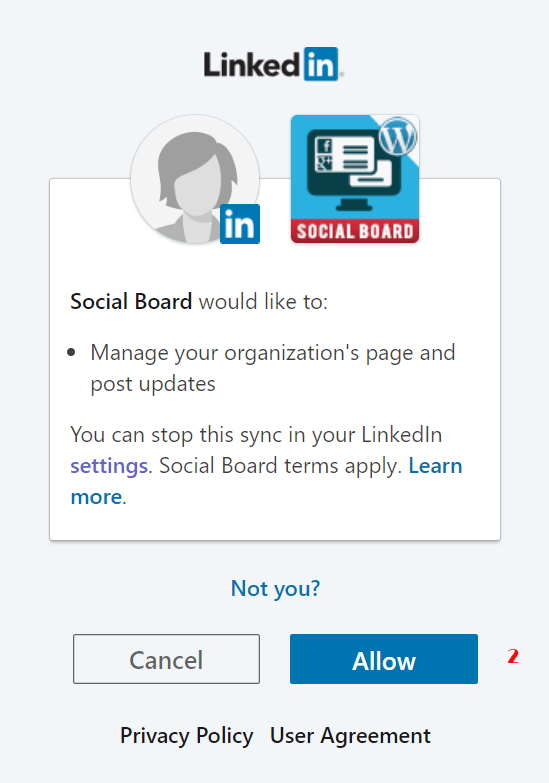 https="0"
If enabled, the Social Stream will get updated automatically without the need to refresh the page - If enabled, the "Cache Time" value will be ignored and considered as 0. The time delay for updating the Social Streams (in minutes). Considering that there are some limits on social networks about the number of requests sent to their API, the minimum allowed value is 1.
cache The time delay for caching of Social Streams (in minutes). cache="360"
network Social Network IDs Look at the following second example. 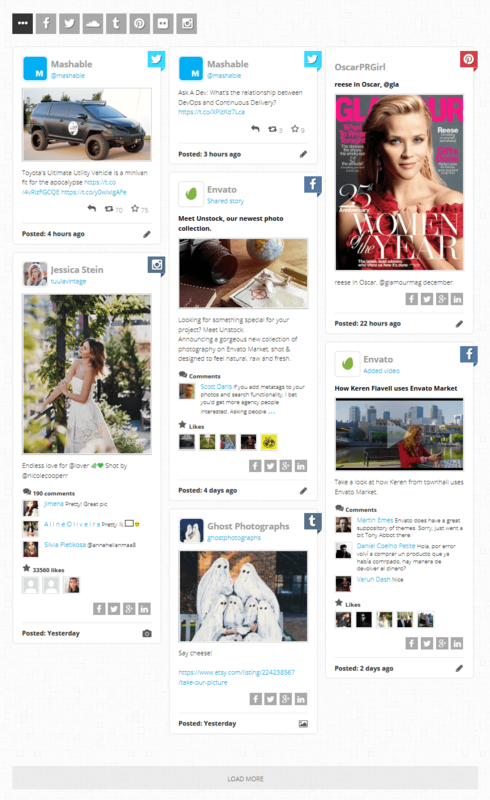 The following shortcode, creates a social network wall in Flat style, displaying the last 30 items of your feeds randomly. The following shortcode, creates a social network wall, displaying the latest items from Facebook, Twitter and Instagram network using the defined inline configs. These parameters can be used only for rotating feed display mode. direction Animation Direction up, down direction="down"
width Width of rotating feed block - Leave empty for no width. width="250"
label This text diplays on rotating feed block header label="Social Media Updates"
height Height of rotating feed block - Leave empty for no height. height="400"
location Where to be displayed on the website. sb-bottom_left, sb-bottom_right, sb-left, sb-right location="sb-bottom_left"
The following shortcode, creates a social network feed in Default style, moving from up to down that do not automatically start rotating on load. The following shortcode, creates a sticky social network rotating feed in Modern style, located in bottom right of the page. These parameters can be used only for Wall display mode. transition Duration of the transition when items change position or appearance - in milliseconds. transition="400"
stagger Staggers item transitions, so items transition incrementally after one another - in milliseconds. stagger=""
filter_search If true, a search box will appear above the social network wall allowing the user to filter the Social Stream items using a search phrase. true, '' filter_search="true"
originLeft Filters Left To Right Direction true, false originLeft="true"
wall_width Width of wall block (px) - Leave empty for full width. wall_width="800"
wall_height Height of wall block (px) - Leave empty for infinite height. wall_height="800"
fixWidth If "false" is set, the "Item Width" value will be applied to each wall item - "breakpoints" will be ignored. If "true" is set, the "breakpoints" sets will be applied to wall items based on browser width. If "block" is set, the "breakpoints" sets will be applied to wall items based on wall container block width. false, true, block fixWidth="false"
breakpoints Defines the number of items (columns) shwoing on each row for different viewport sizes - Requires "fixWidth" to be false or block. breakpoints="5,4,4,3,2,2,1"
itemwidth Width of wall item (px). itemwidth="230"
gutterX The horizontal space between item elements - in pixels. This may changes automatically when "fixWidth" is not true. 10 gutterX="10"
gutterY The vertical space between row elements - in pixels. This may changes automatically when "fixWidth" is not true. 10 gutterY="10"
The following shortcode, creates a social network wall in Modern style, rendering from right to left without animation. These parameters can be used only for carousel display mode. autoWidth "Slide Width" value will be applied to each slide - Number of items will be ignored. true, false autoWidth="false"
cs_item Number of items shwoing in each slide for different viewport sizes - Requires Auto Width to be OFF. cs_item="4,3,2,2,1"
cs_rtl Animation Direction true, false cs_rtl="false"
cs_controls Prev/next buttons 1, 0 cs_controls="1"
cs_auto Auto Start 1, 0 cs_auto="0"
cs_loop Loop slide 1, 0 cs_loop="1"
slideMove Number of slides to be moved at a time slideMove="1"
cs_pager Enable/disable pager option 1, 0 cs_pager="0"
slideMargin Spacing between each slide slideMargin="10"
The following shortcode, creates a carousel social stream in Modern style including 3 items and with a pager. These parameters can be used only for Timeline display mode. onecolumn To display timeline in one column or based on browser screen width true, false onecolumn="false"
This section lists all of your previously added Themes. To edit a Theme, move your mouse pointer on the name of the Theme and click on the "Edit" link to display the Theme configurations in a new page. Make your desired changes and click the "Update" button to save the new configurations. To delete a Theme, move your mouse pointer on the name of the Theme and click on the "Trash" link. This will move the Theme to the Trash folder but, if you are going to remove it permanently from the WordPress system, just go to the Trash tab and delete it permanently. To create a Theme, click Add New Theme button in the Themes management page. Select a name for the theme CSS class selector (without dot). The Stream Layout is the main displaying structure of the output feed items. We have created 3 different layouts for this plugin. You can create your own layout and put in the ./wp-content/uploads/ax-social-stream/layouts/ folder to use here. Edit this file: <your-wordpress-site.com>/wp-content/plugins/ax-social-stream/public/css/styles.css in your WordPress directory using an FTP client and add your own css at the end of the file. Your new layout will be available in add/edit Theme page. In order to set a font size (in px) for the Social Stream. This is the base font size for all type of Social Streams. Here you can change the background colors used for each social network. To change one of the network colors, click on the relevant colored box and a colorpicker should be appeared. Then select the new color and click elsewhere on the screen to close the colorpicker widget. The colored box should now be updated with the new color. These colors apply to network icons, block footers or anywhere defined in layout files. Here you can change the icon used for each social network. To change one of the network icons, enter the direct URL of the icon file or click on the relevant "Select Image" button and an "Upload Image" window should now appear. Some layouts do not use image icons. Here you can change the icon used for each post type. To change one of the type icons, enter the direct URL of the icon file or click on the relevant "Select Image" button and an "Upload Image" window should now appear. Custom CSS for styling the Social Stream can be entered into this text field. Any CSS rules included in this text area will automatically be inserted into the page. Replace <class-name> with the "CSS Class Name" in the current theme. Each type of Social Stream has it's dedicated options in a separate tab. This color applies to your Social Stream background. Select the new background color of the and click elsewhere on the screen to close the colorpicker widget. Select the new border color of the Social Stream and then click elsewhere on the screen to close the colorpicker widget. In order to set a border size (in px) for the Social Stream. In order to set a background image for the Social Stream. Select the new font color for the feed item and then click elsewhere on the screen to close the colorpicker widget. Select the new background color for the feed item and then click elsewhere on the screen to close the colorpicker widget. Select the new border color for the feed item and then click elsewhere on the screen to close the colorpicker widget. In order to set a border size (in px) for the feed item. To receive the product automatic updates you need to register your plugin. On the Stream Settings page, switch to Licensing tab. 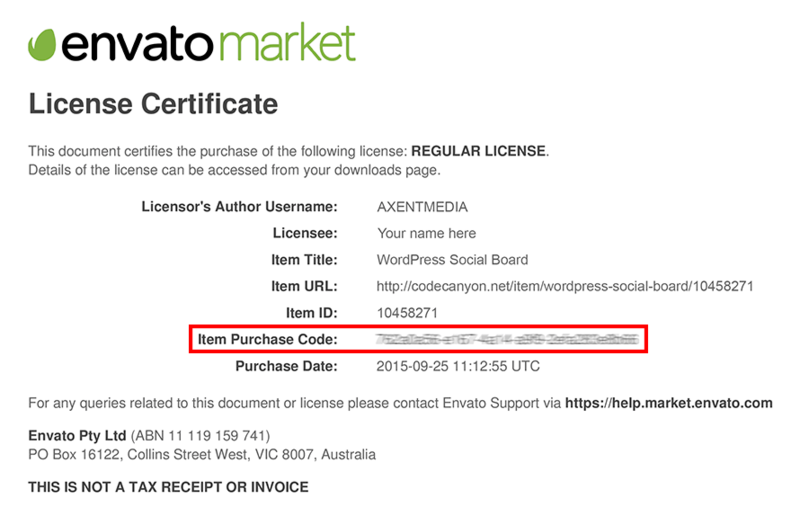 Enter your CodeCanyon purchase key in the License text box and Save Changes. Hover the mouse over your username at the top of the screen and click. 1. Click ‘Downloads’ from the user menu items according to the picture. 2. Click the ‘Download’ green button and 3. click ‘License certificate & purchase code’ (available as PDF or text file) from the drop down list. Can I use the plugin in WordPress Multisite (WPMU) mode? Yes, this plugin works with WordPress Multisite. Try, activating the plugin separately in each website not in the network admin. You have not declared any social network ID in your Social Stream. 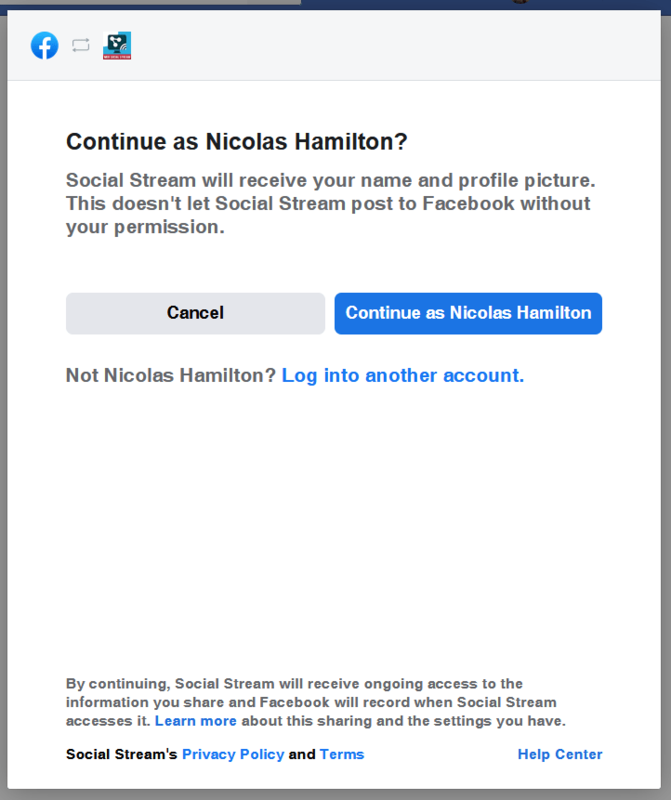 Read about Social Stream configuration. API Credentials for Twitter is not truly set or is not valid. 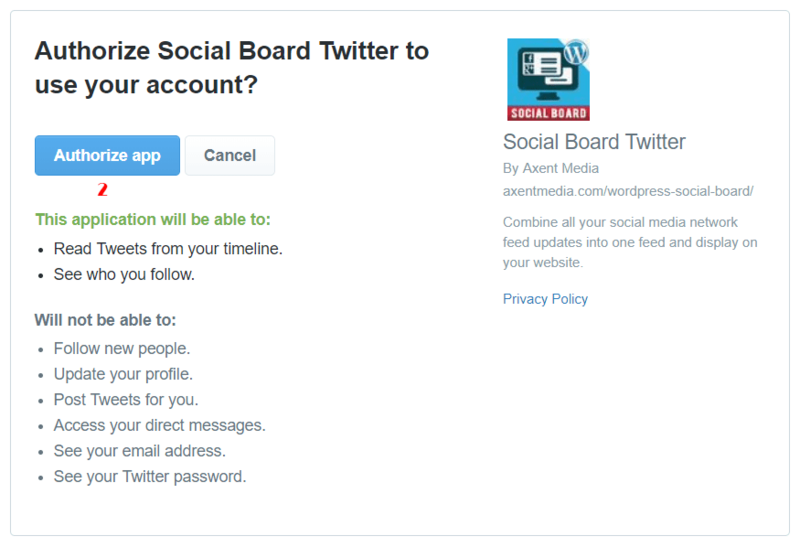 Read this topic for details about Twitter API Credentials configuration. Google API Key is not valid. 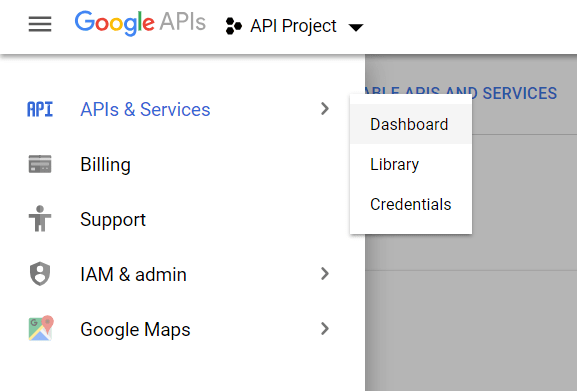 Read this topic to find that how to set Google API Key. Your server has not access to the internet. After fixing the problem, try cleaning the cache from Social Stream » Stream Settings. I don't see the social stream widget! You first need to enable the Rotating Feed from Enabled Layouts section within the Stream Settings page to see the social stream widget in WordPress Dashboard » Appearance » Widgets page. 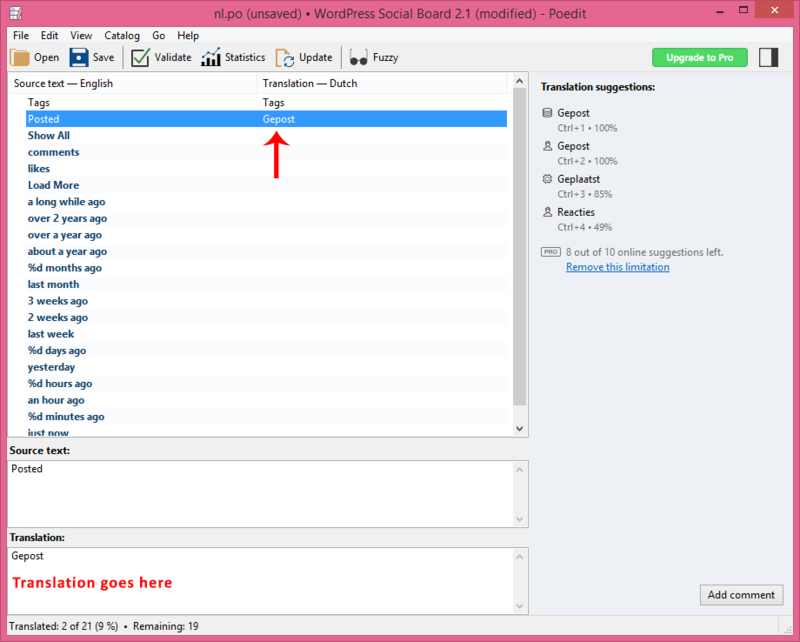 AX Social Stream WordPress plugin is not installed on your website or is inactive. The place where you paste the shortcode is not setup to process shortcodes. You are using the [social_board] shortcode somewhere that acts with the shortcode as a string not a shortcode so it doesn't work correctly. The Social Stream is working but, some networks do not appear? Network account is new and there isn't anything found in its feed or there is no public activity to show on the public feed. Something is incorrectly cached. Try cleaning the cache from Social Stream » Stream Settings. Your Facebook page, group or album ID is incorrect. Read this topic on how to find your Facebook IDs. You are trying to get your Facebook personal timeline feed instead of a Facebook page feed. Read this topic for more details. You are using a Facebook App Token but, your Facebook settings restrict the user that may view your page. You have to remove any age/profanity restrictions from your Facebook page or, use a Facebook User Token instead. Read this topic for more details. Make sure that you have set up your Twitter API Credentials correctly. Read this topic for details about Twitter API Credentials configuration. If your Twitter API credentials is valid, this may be due to the Twitter API limits that is 180 calls per 15 minutes. Unfortunately, this is Twitter API limitations for hashtags or any search that is made via its API platform and we can't change this rule. The Search API is not complete index of all Tweets, but instead an index of recent Tweets. Please check Twitter Search API Documentation for your reference. Make sure that you have set up your API Access Token and it is valid. 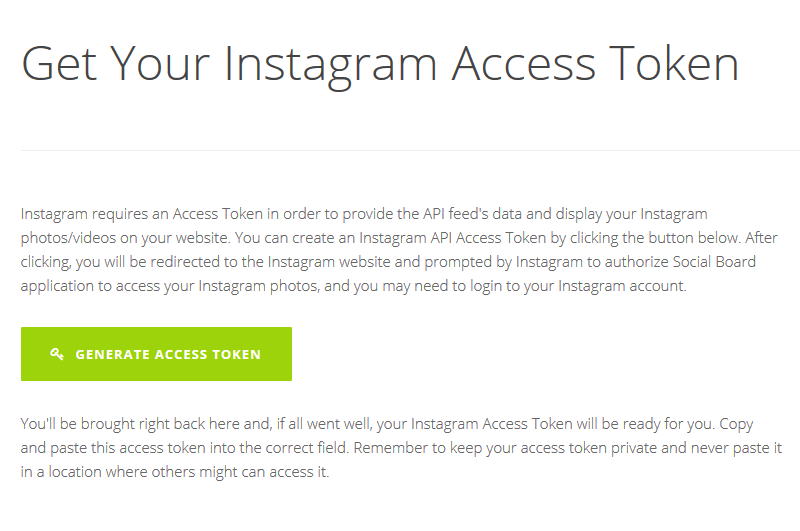 Read this topic to find that how to set Instagram API Access Token. Why do I need to create API credentials? Without creating apps and adding API tokens and keys, your website will not be able to connect to the Social Networking servers. The token authentication makes a secure channel via Social Network server and your website to get the permission to access your social profile and fetch your social feed. How many sites can I use AX Social Stream WordPress Plugin on? You need to purchase one license for each site you want to use AX Social Stream on. 1 site = 1 license, 2 sites = 2 licenses, 3 sites = 3 licenses and so on. It doesn’t matter if they are all in use by the same company, on the same server, by the same developer, etc. The license terms are single use – one license per site. Is there a developer/multi-use license for this pruduct? Currently, the only option is to purchase an individual Regular License for each site on which AX Social Stream will be used. The CodeCanyon standard (Regular/Extended) licenses both are only for individual (single) usage. The only difference is about to charge or not to charge the end customer. We can not also provide you with a developer/multi-use license directly as we have an exclusivity agreement with CodeCanyon that means, we can only distribute our products through them. At this time, for every WordPress site that you have AX Social Stream activated on, you need to purchase an individual Regular or Extended License. 1 site = 1 license, 2 sites = 2 licenses, 3 sites = 3 licenses, etc. YouTube videos are displaying on Social Stream but, can not be played! The problem is because of that your videos are not opening through https links. From your wp-admin, go to Social Stream > Stream Settings. In General Settings section, check/enable the “Load images over https” and Save Changes. AX Social Stream WordPress Plugin - Created By Axent Media - CodeCanyon license. Admin Page Framework - Created by Michael Uno - Released under the MIT license. OAuth library - by Andy Smith - MIT license. OAuth for Twitter's REST API - Created by Abraham Williams. SimpleCache - Created by Gilbert Pellegrom - MIT license. jQuery - Released under the terms of the MIT license. Isotope - Copyright 2016 Metafizzy - Commercial license included. Timeline Drop - by kickdrop.me. JQuery Advanced News Ticker - Created by Valentin Ledrapier - GNU GENERAL PUBLIC LICENSE. Font Awesome - by @davegandy - Licensed under MIT. Colorbox - by Jack Moore - Licensed under MIT. Light Slider - by Sachin N - Licensed MIT. Lazy Load - by Mika Tuupola - MIT license. Special scroll events for jQuery - by James Padolsey. jQuery Expander - by Karl Swedberg - Licensed MIT. API proxy setup setting added. Twitter embedding connection refused error handled. Google+ API deprecated and removed from the plugin. Fixing the problem of displaying Instagram user info on items. Fixing the load more problem of Instagram user items. Fixing the images lazy loading problem which was occurred after v3.4.4. Feature to disable images lazy loading on the social stream. Added the sb-img class to all image tags on social stream. Fixed the 'call stack size exceeded' issue on wall filtering. The problem of wall relayouting while doing load more fixed. Adding meta data to carousel items. Instagram hashtag feed API deprecated and replaced with a new solution. Feature to get other Instagram user public feeds without an access token. Fixing the problem of displaying the Debug tab in WP Dashboard. The problem of listing custom layouts in Add/Edit Theme page has been fixed. LinkedIn post direct link problem fixed. Flickr Photoset/Album feed support added. 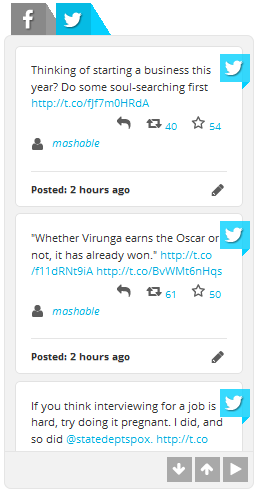 Display a preview of simple shared links in tweets on the item. Feature to add custom height for carousel items. Feature to connect and generate Twitter, Facebook and LinkedIn API credentials directly in plugin. 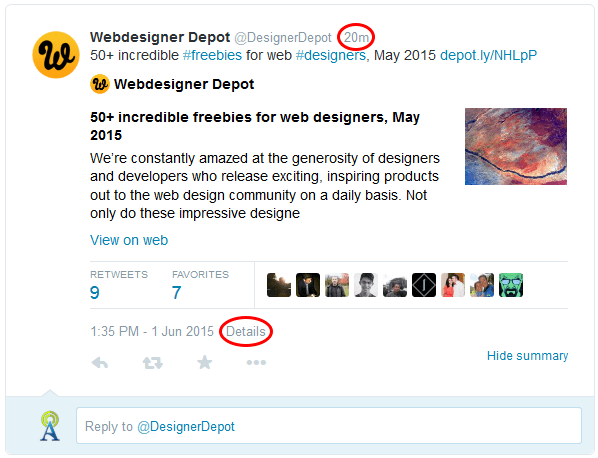 A fix to stop multiple conversion of Twitter shared links to Embed codes. Problem of low-quality video images in Facebook page videos feed has been fixed. SoundCloud user playlists feed added. Instagram multi-account feed access token reading problem fixed. Feature to disable filtering ad items along with social items. Instagram private posts light-box video problem fixed. The problem of extra items more than limit in some cases fixed. Added a feature to convert shared links on Twitter to Embed codes. Instagram hashtags linking problem fixed. LinkedIn datetime problem on timeline fixed. Facebook comments & likes count display problem fixed. Facebook link post title to the original resource which is shared. Instagram and YouTube show comments feature added. Auto trigger show comments in lightbox slideshow mode. Add an admin notice if, layouts activation is not passed. Feature to control the position of the plugin associated files on your website. Load media over https set to true by default. Facebook Graph API v3.0 updated. Facebook's cover photo title problem has been fixed. Plugin renamed to AX Social Stream. Instagram user public feed deprecated problem fixed. Twitter search API 140 characters limit and image displaying problem has been fixed. Trimming the RSS data to fix reading by XML parser. Page scroll lazy load problem fixed. Fixing some Notice errors because of API Changes. Facebook Graph API v2.11 updated and it will no longer display Facebook comment user info. Feature to define a custom size for YouTube videos. Ajax tabbed `There is no feed` problem has been fixed. Conflicting problem with HTML widgets has been fixed. Twitter OAuth library has been updated. Twitter hashtag feed duplicates problem fixed. The wall relayout problem on fixed height mode has been fixed. SVG image converted to base64 inline SVG. SoundCloud tracks' artworks iamge size fixed. Facebook image resize got temporarily disabled. Option to re-layout wall based on page scroll or images load. VK API updated and access token setup is required. Wall twitching problem on IE and some other browsers has been fixed. Facebook multi-share images problem fixed. Fixing the problem that was stopping displaying ads when adding the Social Stream through Visual Composer. The problem of opening videos in system inbuilt player instead of lightbox on IE and Safari has been fixed. Custom filtering tabs feature added. Moving the custom layouts folder to the out of the plugin directory to avoid deleting the layout files after plugin updates. Fixing a problem with showing the links in tweets body. Problem of not displaying more RSS feed items on load more has been fixed. Stream Output setting added to shortcode parameters. Added the feature to disable specific filtering buttons. Facebook image resize on demand problem has been fixed. Problem with session handling when, stream auto update is enabled has been fixed. Problem with pinned items when, stream auto update is enabled has been fixed. Carousel display problem with text only posts has been fixed. A responsive problem in lightbox slideshow has been fixed. Unchecking Title in Stream Output block had not any effect on stream output. Wall sort by date problem on "Stream Auto Update" has been fixed. Changing carousel shortcode from `type="feed" carousel="on"` to `type="carousel"`. Feature to set custom defined height and width for wall layout. Feature to set wall items responsive breakpoints based on container width. RSS extra new lines problem has been fixed. Facebook enable lightbox view for direct GIF animation links. Twitter item text display in lightbox view has been fixed. Facebook notice errors while WP_DEBUG was on, is resolved. Displaying original retweet post instead of the RT text. Framework upgraded to the latest release. Infinite scroll feature added to the the loading more functionality. Plugin update checker problem fixed. Search placeholder added to translation. Notice errors while no twitter search terms result exist resolved. Changing from compatibility to extended mode for Twitter API latest updates. Facebook Graph API v2.7 updated. Gutter X size issue fixed, when set to less than 10 it was displaying post in full width. Limiting access to plugin settings only for users with manage_options capability. New W3 Markup Validation passed for output HTML contents. Twitter unknown video lightbox problem fixed. Twitter videos problem when using hashtags with search API fixed. Problem with decimal separator in different locale settings has been fixed. An issue with reading RSS media content tag fixed. Images lazy load problem with jQuery 1.12.x fixed. Problem with loading images on first page load has been fixed. Problem with hidding images on auto stream update has been fixed. CSS & JS files combined for each display mode. The feature to define the number of columns shwoing on each row for different viewport sizes on wall layout. Duplicate Instagram items problem on load more fixed. Video lightbox support added for Twitter. Fixed the video auto-resize problem with responsive lightbox window. Instagram feed, user search problem fixed. Plugin licensing and one year automatic update added. W3 Markup Validation passed for Stream HTML content. Stream Output setting moved to Social Stream management page. Added an option to define the height of Rotating Feed block. Visual Composer integration problem fixed. Flickr profile image problem fixed. Problem with reading incorrect RSS media enclosure tag fixed. Fixed an error that was thrown when an RSS feed thumbnail was not exit. Problem with pinned & remove items fixed. Images lazy load feature added. Duplicate items problem from tag feeds fixed. A new theme/layout named Metro is added. Tumblr lightbox video support added. Added an option to define, how to display the image for each item. Added an option to allow loading images over https. Vimeo upgraded to the latest API with paging. Filtering the Stream items using a search phrase. RSS feed first image added to the item as thumbnail. Scroll bars removed from lightbox window. Twitter OAuth library confliction fixed. Integrated with Cornerstone and Visual Composer. The gap that appearing at the Stream footer on wall filtering fixed. 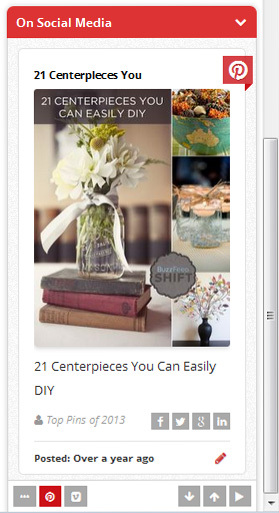 Feature to display Social Stream items as lightbox slideshow. Loading icon added on images. LinkedIn and Vine networks added. Profile thumbnail linked to profile page in Modern2 layout. The exclusion of retweets problem in Twitter lists and search feeds fixed. Duplicate items problem fixed in Load More action. Social API connection timeout increased to solve the problem on low process servers. Opening all images in a lightbox window. Profile thumbnail added in Modern layout. Facebook tiny images' problem fixed. Facebook the latest updates, Profile Unavailable problem fixed. The problem of Opening video in a lightbox window for sticky Ajax Tabbed widget fixed. Network attribute added in shortcode. Item Width mobile viewport problem fixed. Flickr upgraded to the latest API. Load more items added for Flickr. Added video opening in iframe for Instagram, YouTube, Vimeo and Google+. Video icon overlay added on Stream video items. Fix the conflicting problem with some plugins that modify the global $post variable in the admin area. Tumblr upgraded to the latest API v2. Date/time problem in timeline layout fixed. The ability to define the number of items shwoing in each slide for different screen widths on Carousel layout. Stream auto update feature added. Facebook API version 2.4 upgrades, some problems fixed. YouTube videos feed by channel ID added. VK network user or community wall feed by owner ID added. Carousel feed theme display options wasn't working. The ability to remove the block radius border. Social Stream post type related pages removed. Added translation for over 10 languages as po/mo files. Some fixes in layouts and styling. YouTube API limit problem fixed. Load more items problem in timeline layout fixed. Problem in Twitter ID Range fixed. Translation for load more added. 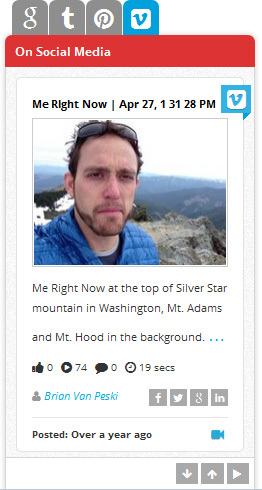 VK network user or community wall feed added. Load more items added for Facebook, Twitter, Google+, Tumblr, Instagram and YouTube. Added the option to select the Stream link colors in theme management. Added an option to adjust the spacing between the columns in wall. Added an option that, let blocks to adjust and re-size to fill the gap in wall. A new theme/layout named Modern 2 is added with an option to display profile avatar. YouTube upgraded to v3 added. Ability to get posts in a certain datetime in Facebook. Ability to get tweets generated in a given date in Twitter. ATOM RSS feed support added. Option to display timeline in one column or based on browser screen width. Fixed a problem in crawl per request. YouTube item description weird characters fixed. Instagram items friendly date displaying problem fixed. The documentation moved out of the plugin folder and hosted online. Facebook API version 2.3 upgrades, implemented. Adding an option to get specific sets of posts for Facebook page feed. Posts published by this page, or by others, or by both on this page. SoundCloud User Tracks feed added. Add support for Facebook Search Term/Hashtag. Facebook "per page limit" problem fixed. Items' footer dates linked to the original post. 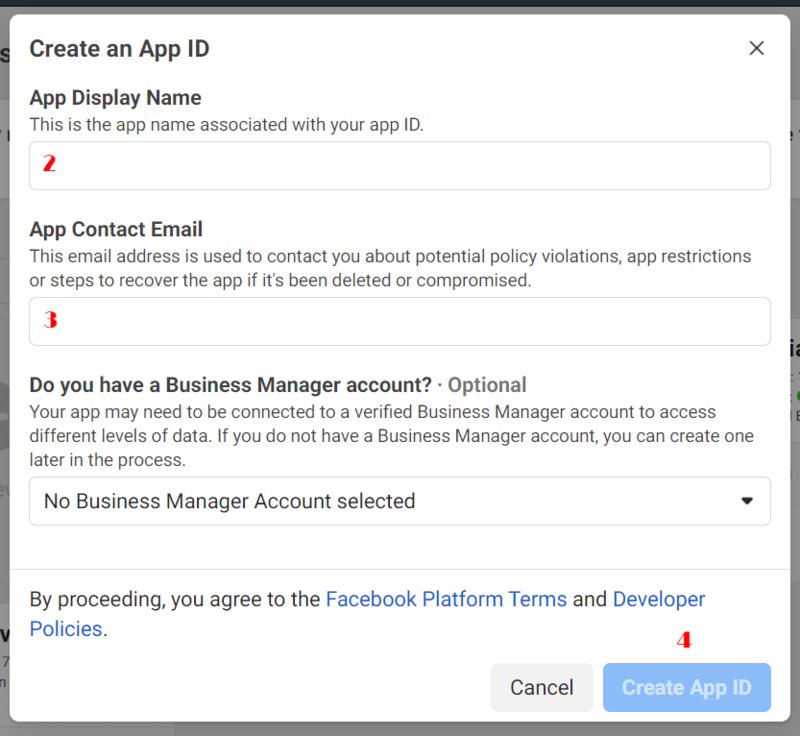 Facebook API Credentials configuration added. Instagram API Access Token and Google+ API Key configurations moved to setting page. Add support for Facebook videos. Add support for multibyte character set languages. Image size selection added for Instagram. Ability to pin a post on top of the Social Stream. Add an option to limit the comments' words count. Added an option to change the status of links to follow or nofollow.